Entwine Jewelry - "Summer in India Necklace"
This necklace is made of crocheted "beaded beads" and individually formed wire links. 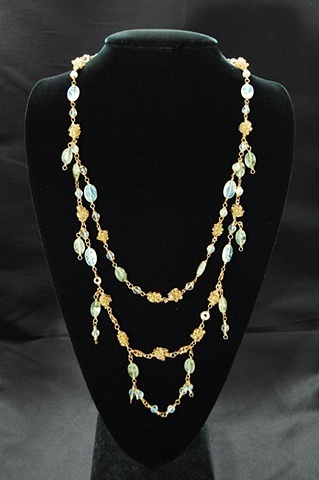 It combines fine gauge brass wire, reticulated lime green quartz, faceted pineapple quartz, and golden glass seed beads. This necklace is finished with a gold-filled filigree clasp.